Louis' Lunch is a hamburger restaurant in New Haven, Connecticut which claims to be the first restaurant to serve hamburgers and the oldest hamburger restaurant in the U.S. It was opened as a small lunch wagon in 1895 and was one of the first places in the U.S. to serve steak sandwiches. According to Louis' Lunch, the hamburger was created in 1900 in response to a customer's hurried request for a lunch to go. In 1917, Louis moved the business into a square-shaped brick building that had once been a tannery. In 1975, the restaurant was moved four blocks down to 263 Crown Street. 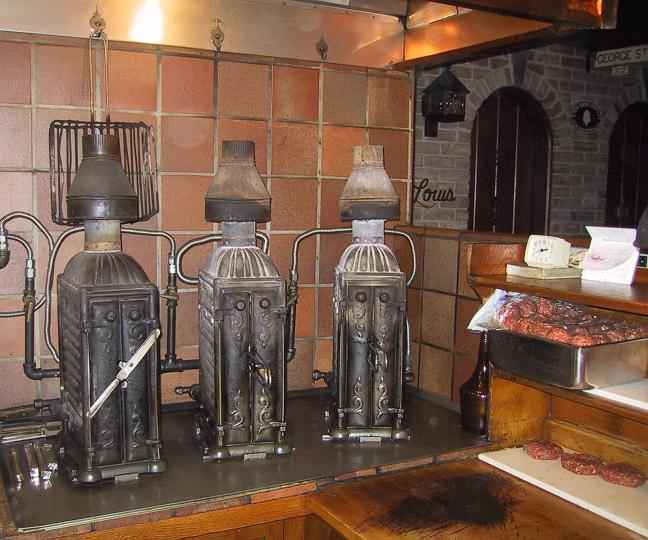 Hamburgers cooked in the restaurant are made on the original cast iron vertical gas broilers from 1898, and the toast is made in a 1929 Savory Appliance Radiant Gas Toaster. Lassen's restaurant is recognized in the Library of Congress as the origin of the hamburger, but other claimants and detractors exist. Louis Lassen (1865 - March 20, 1935) was a "blacksmith by trade and preacher by vocation" and immigrated to New Haven from Denmark in 1886. He became a food peddler, selling butter and eggs from a wooden cart. He purchased a home at 45 Elliot Street and stored his cart in a shed in the backyard. In 1895, he began adding lunch items to his cart. A local businessman dashed into the small New Haven lunch wagon one day in 1900, and he pleaded for a lunch to go. According to the Lassen family, the customer exclaimed "Louie! I'm in a rush, slap a meatpuck between two planks and step on it!". Lassen placed his own blend of ground steak trimmings between two slices of toast and sent the gentleman on his way, so the story goes, with America's alleged first hamburger being served. In 1917, Lassen moved into a square brick building that had once been a tannery. Louis' Lunch was forced to move to make way for development in 1975, so it moved two blocks down to 263 Crown Street in New Haven. In the 1970s, Ken Lassen added cheese spread to the hamburger. The fifth generation of Lassens' owns and operates Louis' Lunch today. The Louis' Lunch menu consists of "The Original Burger," potato salad, potato chips, and homemade pie. Louis' Lunch makes their hamburger sandwiches from ground steak made from a blend of five cuts of beef. The hamburgers are then flame broiled vertically. The hamburgers are prepared with cheese, tomato or onion, then served on two square pieces of toasted white bread. Louis' Lunch flame broils the hamburgers in the original cast iron vertical gas broilers manufactured by the Bridge and Beach, Co., St. Louis, Missouri in 1898. The stoves use hinged steel wire gridirons to hold the hamburgers in place while they cook simultaneously on both sides. The gridirons were made by Luigi Pieragostini and patented in 1938. A sharp cheese spread is used, as opposed to sliced cheese. 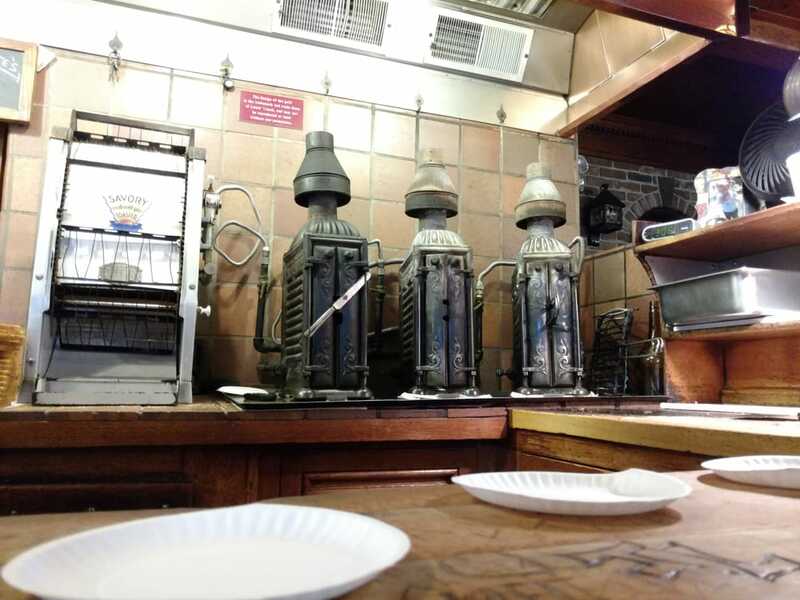 The restaurant uses a 1929 Savory Radiant Gas Toaster. The restaurant is traditionally closed during the month of August (for annual spoon-counting). In 2014, Louis' Lunch was closed from August 3 to September 1. Many others claim to be the creator of the hamburger, including Charlie Nagreen, brothers Frank and Charles Menches, Oscar Weber Bilby, and Fletcher Davis. White Castle traces the origin of the hamburger to Hamburg, Germany with its invention by Otto Kuase. However, it gained national recognition at the 1904 St. Louis World's Fair when the New-York Tribune namelessly attributed the hamburger as "the innovation of a food vendor on the pike." In 2000, the Library of Congress recognized Louis' Lunch as the creator of the hamburger after being backed by United States Representative Rosa L. DeLauro. The Library of Congress stated that Louis Lassen sold the first hamburger and steak sandwich in the U.S. in 1900. New York magazine states, "The dish actually had no name until some rowdy sailors from Hamburg named the meat on a bun after themselves years later," noting also that this claim is subject to dispute. Detractors of the Louis' Lunch claim include Josh Ozersky, a food editor for New York Magazine. In Ozersky's book, The Hamburger: A History, Ozersky denies the claim based on the definition of a hamburger and told the New Haven Register, "If you say it can be on toast, you're essentially redefining the hamburger out of existence. The hamburger as the world knows it means a sandwich of ground beef on a bun." However, Motz's Hamburger America notes that the hamburger bun did not exist in 1900 nor did so for another 20 years. Ozersky's book also notes earlier claimants and recognizes Walter Anderson for creating the modern hamburger. In 2006, a "mock trial" was held by the Hamburger Festival in Akron, Ohio. Louis' Lunch was noted to have taken the event seriously, in contrast to other representatives of other hamburger creator claimants. Renny Loisel, public relations director of the Greater New Haven Convention and Visitors Bureau, submitted an affidavit and letter from the New Haven Preservation Trust and noted that the Library of Congress recognizes Louis' Lunch for creating the first hamburger, but the evidence was denied. According to an internet poll, Louis' Lunch placed third and Loisel noted that despite the evidence it was more about theatrics than truth. An article from ABC News sums up the problems of identifying the origins of the hamburger by stating, "One problem is that there is little written history. Another issue is that the spread of the burger happened largely at the World's Fair, from tiny vendors that came and went in an instant. And it is entirely possible that more than one person came up with the idea at the same time in different parts of the country." The restaurant has been the subject of shows on "the Travel Channel, the Food Network, the History Channel and even Oprah." On Travel Channel's Chowdown Countdown, Louis' Lunch was rated #1. Episode 10 of Burger Land, A Burger is Born, highlights the claim and history of Louis' Lunch. According to Raichlen's book, BBQ USA, patrons of Louis' Lunch include United States presidents George H. W. Bush and George W. Bush, Charles Lindbergh, and Artie Shaw. Food & Wine's website named Louis' Lunch as one of the "Best Burgers in the U.S." Roadfood notes that it is an "essential stop on America's burger trail." Critics of the restaurant hinge on its dislike of condiments, particularly ketchup. In episode 10 of Burger Land, the "no ketchup" sign is visible hanging in the restaurant and an informative caption pops up to read "Yale students who try to sneak in ketchup are asked to leave." According to "American Food Roots," signage and an exchange of stories confirms the policy. Tom Gilbert wrote, "Louis’ Lunch is a very friendly place as long as you get with the program, which always has been about serving quality beef and making sure that nothing ruins or upstages it. As Jeff [Lassen] will tell you, that means no puffy, sweet bun, no well-done meat and no ketchup..." Both Connecticut Museum Quest and American Food Roots note the strong presence for the restaurant's way and Menuism goes so far as to note it the #2 of "the 5 Least Welcome Places for Ketchup." Even Esquire affirms, "You can get your hamburger sandwich topped with onions, tomato, and a squirt of Cheez-Wiz. Just don't ask for anything else." On the wall a sign reads "this is not Burger King you can't "have it your way." You get it my way or you don't get the damn thing." ^ You've Got (1 March 2013). "The Original Hamburger: Jeff Lassen". AOL. Retrieved 14 April 2018 – via YouTube. ^ a b Aldimar Video Productions (6 February 2007). "Hamburger Wars". Retrieved 14 April 2018 – via YouTube. ^ "patent US521718A". patents.google.com. Retrieved 14 April 2018. ^ en "patent US457316A". patents.google.com. Retrieved 14 April 2018. ^ "patent US2931352A Vertical gas broiler". patents.google.com. Retrieved 14 April 2018. ^ Ohio Electric Light Association. "Proceedings of Ohio Electric Light Association". Douglas A. Brown. Retrieved 14 April 2018 – via Google Books. ^ "Savory Appliance Radiant Gas Toaster". LiveAuctioneers. Retrieved 14 April 2018. ^ Alamy. "View New Haven Ct Usa". alamy.com. Retrieved 14 April 2018. ^ a b c d e f Raichlen, Steven (2003). BBQ USA: 425 Fiery Recipes from All Across America. Workman Publishing. pp. 336–337. Retrieved 28 May 2014. ^ a b c Caplan, Colin (2013). Legendary Locals of New Haven. Arcadia Publishing. pp. 108–109. ^ Price & Lee's New Haven (New Haven County, Conn.) City Directory. Price & Lee Company. 1899. p. 375. ^ a b "Burger at Louis' Lunch". Connecticut Museum Quest. Retrieved 29 May 2014. ^ Hughes, Holly (2009). Frommer's 500 Places for Food and Wine Lovers. John Wiley & Sons. p. 229. ^ LLC, New York Media (16 May 1977). "New York Magazine". New York Media, LLC. Retrieved 14 April 2018 – via Google Books. ^ a b c Motz, George (2011). Hamburger America: Completely Revised and Updated Edition: A State-by-State Guide to 150 Great Burger Joints. Running Press. ^ a b Jane Stern & Michael Stern (2011). Roadfood: The Coast-to-Coast Guide to 800 of the Best Barbecue Joints, Lobster Shacks, Ice Cream Parlors, Highway Diners, and Much, Much More. Random House LLC. p. 14. ^ "The Original Burger: Louis' Lunch Burger Copycat Recipe". johanjohansen.dk. 16 February 2016. Retrieved 14 April 2018. ^ "Menu - Louis' Lunch". Louis' Lunch. Retrieved 28 May 2014. ^ "Conveyor Archives - Star Manufacturing". Star Manufacturing. Retrieved 14 April 2018. ^ "Inside Louis' Lunch, the 120-Year-Old Birthplace of the Hamburger". eater.com. Retrieved 14 April 2018. ^ Limited, Alamy. "Stock Photo - Pulling out hamburgers from the 1895 hamburger broilers at Louis' Lunch hamburger joint in New Haven, CT, USA, 26 May 2009". Alamy. Retrieved 14 April 2018. ^ "Indoor grill - SteakHouse indoor electric grill from Ariete". appliancist.com. 20 February 2008. Retrieved 14 April 2018. ^ "Vertical Grill Gresilva®". gresilva.com. Retrieved 14 April 2018. ^ Admin, Site (1 January 2015). "TOPONAUTIC Outdoor News-Events-Recipes: Identifying BRIDGE BEACH & CO Cast Iron". toponautic.blogspot.com. Retrieved 14 April 2018. ^ Harris, Howell (29 January 2015). "A Stove Less Ordinary: Hudson Erastus Bridge, the First Stove Founder in the Trans-Mississippi West". stovehistory.blogspot.com. Retrieved 14 April 2018. ^ "I have a Bridge Beach Co. St. Louis stove. I would like to…". justanswer.com. 24 February 2015. Retrieved 14 April 2018. ^ "Hamburger America". 29 August 2004. Archived from the original on 29 August 2004. Retrieved 14 April 2018. ^ Zincavage, David. "Never Yet Melted » Invention of the Hamburger in Contention". neveryetmelted.com. Retrieved 14 April 2018. ^ a b Eats, Serious. "A Visit to Louis' Lunch, Home of the Hamburger". aht.seriouseats.com. Retrieved 14 April 2018. ^ a b c "Birthplace of the Burger (Clip from Episode 10 of Burger Land - A Burger is Born)". Travel Channel. Retrieved 29 May 2014. ^ a b "Aged Beef". trippyfood.com. Retrieved 14 April 2018. ^ "Where's the Beef? At Louis' Lunch in New Haven! - Comestiblog". comestiblog.com. Retrieved 14 April 2018. ^ a b c Gilbert, Tom (March 17, 2013). "Having it their way: eating at Louis' Lunch". American Food Roots. Retrieved 29 May 2014. ^ Frucci, Adam. "A Steak Toaster. Did You Hear Me? I Said a Steak Toaster". gizmodo.com. Retrieved 14 April 2018. ^ "Antique Stoves and Appliance magazine, The Old Road Home". www.antiquestoves.com. Retrieved 14 April 2018. ^ "PARTS & SERVICE Manual for CG-30 Gas Conveyor Toaster". cpsohio.com. Retrieved 14 April 2018. ^ "The Evening News from Harrisburg, Pennsylvania on March 7, 1932 · Page 4". newspapers.com. Retrieved 14 April 2018. ^ "Merco/Savory Toaster Parts". www.tntequipment.com. Retrieved 14 April 2018. ^ Blumenthal, Heston (1 January 2007). "Further Adventures in Search of Perfection: Reinventing Kitchen Classics". Bloomsbury Publishing. Retrieved 14 April 2018 – via Google Books. ^ "Merco Savory". 3 October 1999. Archived from the original on 3 October 1999. Retrieved 14 April 2018. ^ "PARTS & SERVICE MANUAL for RT-2VSE & RT-2VSHO TOASTER" (PDF). manualsonline.com. Retrieved 14 April 2018. ^ "RT-2 Series Bread & Bun Toasters". mercoproducts.com. Retrieved 14 April 2018. ^ "Merco/Savory LLC: Company Profile". Bloomberg. Retrieved 14 April 2018. ^ "Merco Savory Parts and Accessories". WebstaurantStore. Retrieved 14 April 2018. ^ "Where's the Beef? At Louis' Lunch in New Haven!". comestiblog.com. Retrieved 14 April 2018. ^ "Celebrate National Hamburger Day in CT, where a burger-with-bread began". Shelton Herald. Retrieved 29 May 2014. ^ "Long Lunch - Daily Nutmeg". dailynutmeg.com. 3 September 2013. Retrieved 14 April 2018. ^ Sam Gazdziak (August 1, 2006). "Giving the BURGER its due: the hamburger's origins are somewhat shrouded in mystery, but there is no doubt as to its impact on American dining habits and culture.(Editorial)." The National Provisioner. BNP Media. ^ a b Nancy Ross Ryan (February 6, 1989). Great American food chronicles: the hamburger. (restaurant marketing). Restaurants & Institutions. Reed Business Information, Inc. (US). ^ Rogers, Owen. "Louis' Lunch and the Birth of the Hamburger". Connecticut History.org. Retrieved 24 May 2014. ^ Beach, Randall (February 3, 2008). "Louis' Lunch has beef with book claiming it didn't invent the hamburger". New Haven Register (New Haven, CT) – via HighBeam Research (subscription required). Archived from the original on January 16, 2013. Retrieved 24 May 2014. ^ Ozersky, Josh (2008). The Hamburger: A History. Yale University Press. pp. 29–38. ^ Yagla, Elizabeth (August 25, 2006). "Burger beef; Louis Lunch defends its claims as home of the hamburger". New Haven Register (New Haven, CT) – via HighBeam Research (subscription required). Archived from the original on January 16, 2013. Retrieved 24 May 2014. ^ Yagla, Elizabeth (September 9, 2006). "Despite evidence, Louis Lunch takes 3rd at 'hearing'". New Haven Register (New Haven, CT). Archived from the original on September 24, 2015. Retrieved 24 May 2014. ^ Berman, John & Millhon, Drew (February 20, 2007). "A Major Beef! Who Invented the Hamburger?". ABC News. Retrieved 24 May 2014. ^ Wolf, Sarah (April 4, 2008). "A century later, Louis' Lunch still lives up to the hype". Yale Daily News. Retrieved 28 May 2014. ^ "101 Tastiest Places to Chowdown". Travel Channel. Retrieved 29 May 2014. ^ Ratha Tep & Lawrence Marcus. "Best Burgers in the U.S." Food and Wine. Retrieved 29 May 2014. ^ "Inside the Louis' Lunch Hamburger - Gear Patrol". gearpatrol.com. 3 July 2015. Retrieved 14 April 2018. ^ "Visit the Birthplace of the Hamburger". tripsavvy.com. Retrieved 14 April 2018. ^ "Louis' Lunch photos". Yelp. Retrieved 14 April 2018. ^ Lee, Robyn. "The Girl Who Ate Everything: New Haven Food Tour: Part 4 (Louis' Lunch)". roboppy.net. Retrieved 14 April 2018. ^ "Louis Lunch at HollyEats.com". hollyeats.com. Retrieved 14 April 2018. ^ "Pequeño LdN: Las hamburguesas de Louis". pequenoldn.librodenotas.com. Retrieved 14 April 2018. ^ "Louis' Lunch". wordpress.com. 19 October 2011. Retrieved 14 April 2018. ^ "Louis Lunch- Birthplace of the Hamburger- New Haven, CT". boardingarea.com. 16 November 2011. Retrieved 14 April 2018. ^ "Chow down at Louis' Lunch: The birthplace of the Hamburger Sandwich". mapquest.com. Retrieved 14 April 2018. ^ Little, Brian (4 July 2013). "The Food Brag: Hamburgers and America. Happy 4th of July!". thefoodbrag.blogspot.com. Retrieved 14 April 2018. ^ Kohatsu, Kim (October 28, 2013). "The 5 Least Welcome Places for Ketchup". Menuism. Retrieved 29 May 2014. ^ Gunnison, Elizabeth. "The Hamburger at Louis Lunch". Esquire. Retrieved 29 May 2014. This page was last edited on 26 February 2019, at 19:44 (UTC).